The Canadian tar sands have been called the “most environmentally destructive project on earth”, with good reason. But what if we told you that a significant proportion of the climate impact from exploiting the tar sands has been overlooked? 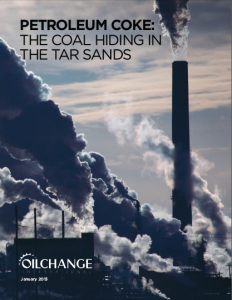 That’s the story told in our latest report: Petroleum Coke: the Coal Hiding in the Tar Sands. It turns out that analysts have been examining the liquid fuels derived from tar sands bitumen and calculating the emissions associated with producing those light liquid fuels (i.e. gasoline and diesel), and adding the emissions from burning those liquid fuels to derive a “well-to-wheels” analysis of emissions. On this basis alone, the European Commission has determined that the emissions from tar sands derived fuel are 23% greater than fuel from conventional crude used in Europe. But tar sands bitumen is a semi-solid hydrocarbon. In fact a barrel of bitumen contains 24% more carbon than a barrel of conventional light oil. This additional carbon does not make its way through to the gasoline and diesel manufactured from tar sands bitumen. It is removed. This ‘removed’ carbon doesn’t disappear; far from it. In fact 15 to 30 percent of a barrel of tar sands bitumen is converted during the refining process into a coal-like solid fuel called petroleum coke or ‘petcoke’. This is considered a byproduct of tar sands refining and most analysts assessing the climate impact of the tar sands have to date dismissed the emissions from burning this petcoke. They have done this partly because they have not developed a methodology to include petcoke emissions into their calculations of the emissions from the liquid fuels. Some have recognized it’s there and have raised it as an issue for further study. But industry analysts including IHS CERA, which has published two studies on tar sands greenhouse gas emissions entitled “Getting the Numbers Right”, consider the emissions from burning petcoke as “negligible”. The assumption is that petcoke simply replaces coal and therefore there is no net emissions rise. This is a convenient but entirely misguided assumption. Petcoke is like coal, but is in fact dirtier. Petcoke has even higher carbon emissions than already carbon-intensive coal, emitting between 5 to 10 percent more CO2 than coal per unit of energy produced. A ton of petcoke yields on average 53.6 percent more CO2 than a ton of coal. So even if petcoke did simply replace coal, which is not the case, the net emissions from whichever activity the petcoke is fueling (eg: power generation) are higher. But because petcoke is a byproduct refineries price it “to move”. It is selling into the market at around a 25% discount to coal. Now we all know (don’t we?) the basic law of economics. More Supply = Lower Prices = More Demand. But growing supplies of petcoke are not only adding to the global supply of fuel for coal-fired power generators, they are undercutting coal on price. Indeed industry analysts have shown that a typical 1 gigawatt coal plant can save around $120 million per year in fuel costs by blending petcoke with coal in their boilers. That sounds to us like a boon for coal-fired generators and a bad deal for cleaner fuels competing with coal in a tight market. Our report reveals the following startling facts about the tar sands and petcoke. Petcoke in the tar sands is turning American refineries into coal factories. • There is 24 percent more CO2 embedded in a barrel of tar sands bitumen than in a barrel of light oil. • 15 to 30 percent of a barrel of tar sands bitumen can end up as petcoke depending on the upgrading and refining process used. • Of 134 operating U.S. refineries in 2012, 59 are equipped to produce petcoke. • U.S. refineries produced over 61.5 million tons of petcoke in 2011 – enough to fuel 50 average U.S. coal plants each year. • In 2011, over 60 percent of U.S petcoke production was exported. Keystone XL will fuel five coal plants and thus emit 13% more CO2 than the U.S. State Department has previously considered. • Nine of the refineries close to the southern terminus of Keystone XL have nearly 30 percent of U.S. petcoke production capacity, over 50,000 tons a day. • The petcoke produced from the Keystone XL pipeline would fuel 5 coal plants and produce 16.6 million metric tons of CO2 each year. • These petcoke emissions have been excluded from State Department emissions estimates for the Keystone XL pipeline. Including these emissions raises the total annual emissions of the pipeline by 13% above the State Department’s calculations. Cheap petcoke helps the coal industry. • As a refinery byproduct, petcoke is “priced to move”, selling at roughly a 25 percent discount to conventional coal. • Rising petcoke production associated with tar sands and heavy oil production is helping to make coal fired power generation dirtier and cheaper – globally. • From January 2011 to September 2012, the United States exported over 8.6 million tons of petcoke to China, most of which was likely burnt in coal-fired power plants. “PetKoch”: The largest global petcoke trader in the world is Florida based Oxbow Corporation, owned by William Koch – the brother of Charles and David Koch. • Oxbow Carbon has donated $4.25 million to GOP Super PAC s, making it the one of the largest corporate donors to super PACs. • Oxbow also spent over $1.3 million on lobbyists in 2012. As mentioned above, the impacts of petcoke on the local and global environment have not been considered by regulatory bodies in assessing the impacts of the tar sands. Petcoke’s full impacts must be considered by the European Union in its debate on the Fuel Quality Directive, by the U.S. State Department in its consideration of the climate impacts of the Keystone XL pipeline, and by Canadian, American, and European governments in tar sands policies across the board. Increasing petcoke use is a clear result of the increasing production of tar sands bitumen. Petcoke is a seldom discussed yet highly important aspect of the full impacts of tar sands production. Factored into the equation, petcoke puts another strong nail in the coffin of any rational argument for the further exploitation of the tar sands. Yes indeed, not just the US has a Koch problem but the whole world. In point of fact, i would say we have a World-Killer Koch Problem. Stop this criminal free enterprize. We should avail ourselves of every opportunity to put more pressure on the government to be more active as far as global warming is concerned. Actually it’s one of the most important issues within the so-called Greenest City 2020 Action Plan introduced in my native Vancouver whose aim is to eliminate the negative impact that our actions have on the environment. I’m convinced if all of us contribute to that common goal by our own efforts the first positive signals will be seen even in the short term. However, I’m afraid these efforts can easily be thwarted by such crazy plans as the Keystone pipeline or other projects posing serious threats to the environment.